I have the sleeping patterns of a college student and in your late twenties unfortunately it starts to catch up to you. Staying up until the wee hours of the morning, leaving the TV on while you fall asleep and drinking caffeine after 4 PM is not exactly ideal sleeping habits. Over the past couple years, I have tried to incorporate better sleep habits into my daily routine in order to get more hours of sleep at night, feel more refreshed in the mornings & actually get my daily to-do list done without feeling worn out. Sleep is important for functioning effectively in life and plays a significant role in health and well-being. March is National Sleep Awareness Month so I thought why not a better time then to share some of my tips for getting a good night's sleep. 1. Night Time Pampering: Finding time to unwind isn't always the easiest thing to do but I do find that that starting a warm bath with some of my favorite lush bath bombs or Jo Malone oils is one way to help me get mentally prepared to catching some zzz's. Taking a warm bath can help relax your muscles, which helps the mind relax as well. 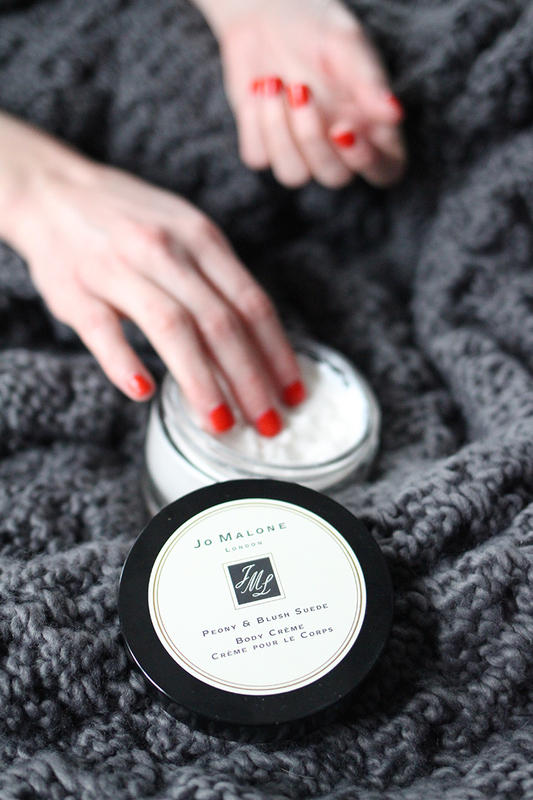 I love moisturizing with the Jo Malone body creme's & using Honest Hazel eye gels to sooth my eyes. 2. Turn off electronics & unwind with a good book/glossy or tea: Turning off electronics is probably the toughest thing for me to do. I always have a blog post to finish, a you tube video or TV show to watch, blogs to read or social media to catch up on. I feel like it is never ending & by the time I actually get ready for bed my brain is in overdrive & I can't shut it off. Finding a way to stay away from electronics atleast 2 hours before you plan on going to bed is ideal for helping your brain take a step back and slow down. I try to grab a book I have been reading & drink a cup of sleepy time. I find that the sleepy time tea relaxes me & gets me thinking of sleep. 3. White Sheets: Statistics say that sleeping in white sheets helps the brain feel fancy, like you are staying in a 5 star hotel. We have grey sheets & white sheets & I will say that I feel calmer when the white sheets are on the bed. These Christy Linen sheets* are super soft & have been a great addition to our bedroom. 4. Cute Pajamas: I am not sure if this is even a thing, but wearing cute + comfy pajamas to bed def. help me. These eberjay giselle short* pjs + lace bralette are extremely soft + comfy! 5. Diffuse Young Living Essential Oils: For the past 6 months I have been diffusing Lavender and Lemon Essential Oils at bed time. The soft sound of the diffuser alone creates a healthy environment for a good nights sleep by calming the mind, body and spirit. The Lavender is one of my favorite oils especially since it is so calming and soothing. The lemon adds a refreshing touch to the lavender. There are nights when I forget to turn on the diffuser (or I am too lazy once I get into bed) & N insists on turning it on. My sleep habits have improved since we started using the EO's + diffuser.